Ok…my blog is about cheap foraging ideas, and a 25 dollar parrot toy is not cheap, but hear me out. This particular toy is so reusable as a foraging toy, that it really becomes cheap on a ‘per use’ basis (as opposed to a toy that either 1.) the parrot never plays with or 2.) he destroys in minutes). This toy can be filled with so many different things. 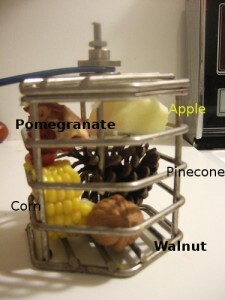 For example, on the day I took the photo, I filled the nut cage with a piece of corn on the cob,pomegranate, apple, a pinecone, and a walnut. Another thing I fill it with is a small foraging box, instead of hanging it in the cage with string. The possibilities with this toy are endless and it is truly economical, considering how much use my parrots have gotten out of it!